The evening will be a fun, friendly, and free networking event and opportunity to learn more about this innovative educational approach from leaders in the field. Food and drink will be available for purchase as well as raffle tickets for fabulous prizes! Founded in 2011, The Virtual Exchange Coalition’s goal is to make it possible for all young people across the globe to have a meaningful cross-cultural experience as part of their education. 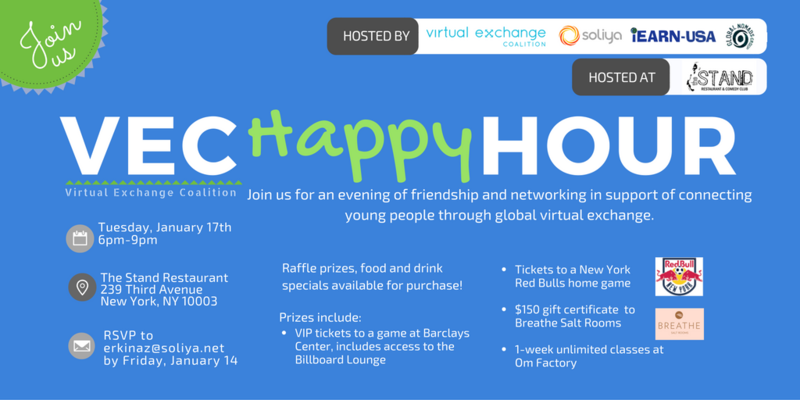 The VEC Happy Hour is hosted by the three founding member organizations of the VEC: Global Nomads Group, iEARN-USA, and Soliya. To attend the event please RSVP to [email protected] by Friday, January 14.